Forces of Nature nail fungus control promises to safely eliminate nail fungus with a powerful, certified-organic nail fungus cure. It guarantees its results. 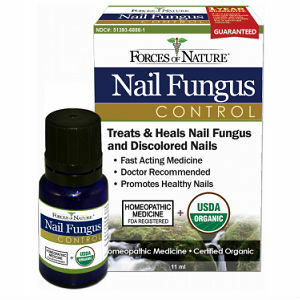 Forces of Nature is an organic remedy which promises to eliminate fungus in and under the nail. It states it will heal without harming the skin and contains no chemicals nor does it have any side effects. It comes in both regular and extra strength. Forces of Nature is in a purple glass bottle which comes in a white box with instructions and labels. Forces of Nature makes strong promises, so I set about checking the product out. After washing and thoroughly drying the affected areas, users should apply 1-2 drops and gently rub into the affected area. This should be repeated 3 times per day. Hands should be washed afterwards and it is not recommended for children under the age of three. There are two types of Forces of Nature nail fungus control: regular and extra strength. Each type comes in both an 11 ml and 33 ml bottle. The regular strength 11 ml bottle is $26.95 while the 33 ml bottle is $59.85. For an 11 ml bottle of extra strength the price is $19.95, and for 33 ml it is $64.85. Both of the 33 ml bottles are currently at a special price. Yes! The website is very clear about their guarantee. There is a 100% money back guarantee valid for one year after purchase. Their website states that they are so confident in their products that if they do not work then they do not deserved to be paid and offer a full refund. There is also a customer testimonial stating their happiness with the product. Forces of Nature seems like a sound product with a sensible treatment routine to follow and affordable prices. The website has a very strong return policy and quality guarantee, which is good to see. Despite this guarantee, there was only one review I could find on the website about the product, and though it was complimentary, it was only one review and therefore not a great sample size for potential buyers. Jack Stevens	reviewed Forces of Nature	on May 19th	 and gave it a rating of 3.